CABIN FEVER SALE! HOT DEALS take away the chill! 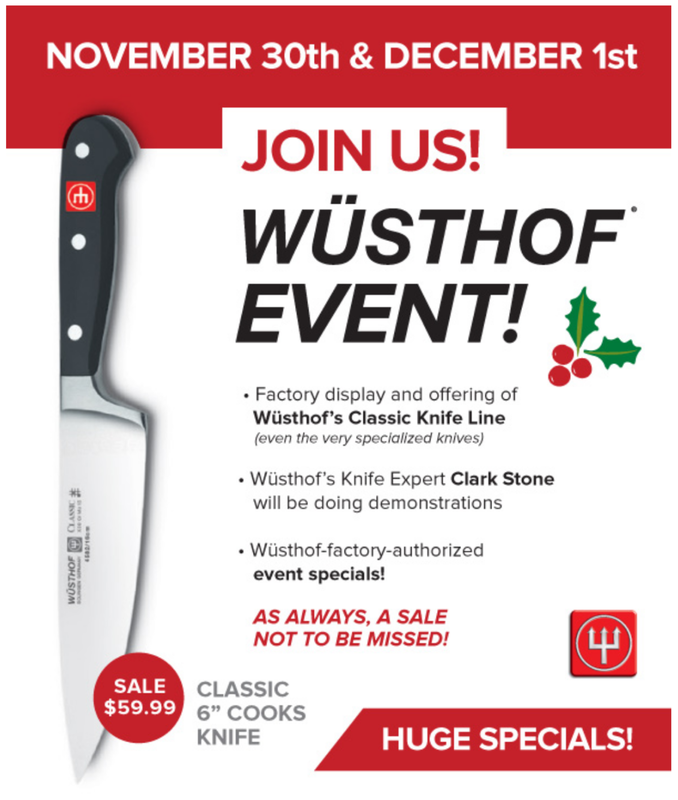 Join us at this annual event that couldn’t come at a better time! Wüsthof Knife Experts, Clark Stone and Fran Quinn, will be on hand to showcase the factory display of Wüsthof’s Classic Knife line. They’ll be doing demonstrations (so fun to watch! ), and offering the best deals of the season. Who doesn’t need a nice, new sharp knife? EAST VILLAGE PROMENADE - A Good Time for All! It’s happening all over the East Village -- a boutique shopping, food enjoying, ice skating & sculpture, festive caroling, a good time for all! We’ll be serving holiday goodies -- inspiration for your own kitchen fun. The Garnier Thiebaut Trunk Show will be held Friday, October 26th from 11 am - 5:00 pm and Saturday, October 27th from 9:00 am - 1:00 pm. Special Order linens will be 20% off Friday and Saturday. Stop in to order your holiday linens! European Heritage Event with Wüsthof and Le Creuset! Join us to celebrate Le Creuset and Wusthof at Kitchen Collage. Known for unparalleled craftsmanship and the preservation of artisan manufacturing traditions, these two brands will be featured. October 19 & 20 only! Shop for Limited Edition Pieces, Special Promotions, Product Demos, Tasty Bites and Beverages. Blue Ribbon Sale - August 14th-18th - Huge Savings! 25% off Coupon! Come in to celebrate the Royal wedding with Lemon Elderflower Cake & Champagne. There will be crowns, cake and cocktails all day at the Collage. Not the one getting married, but know someone that is? Refer the newly engaged couple and we will send you a $25 Kitchen Collage gift card when the happy couple registers with us. Icebox Sale! HOT DEALS take away the chill! Meet Kent Means on Sunday, December 3, from 1-3 pm. Kent creates beautiful charcuterie and cutting boards. They make great gifts and are entertaining essentials for your upcoming holiday parties. Jill Means will be here to show you how to put together a charcuterie board. Great local cheeses will be served. Stop by the store on Sunday afternoon to meet local artist, Joanne Roth of Modern Monogramming. The options are endless for custom monogramming! BUY 4 MONOGRAMMED ITEMS, GET THE 5th FREE! ENTER TO WIN A CUSTOM MONOGRAMMED SET of 4 COCKTAIL NAPKINS! October 13 & 14 only! Shop for Limited Edition Pieces, Special Promotions, Product Demos, Tasty Bites and Beverages. Local Artist Meet & Greet: Delaney Lynch - FREE! Join us in welcoming local artist, Delaney Lynch. You'll enjoy seeing her beautiful artwork many of which include nature's foods in beautiful amalgams with a variety of mediums. Coffee and cookies will be served! Captivating Delaney Lynch Food Art! Coffee & Donuts Oh My!! Stop by the store and learn how to brew great coffee at home! We will also be serving up homemade donuts! We will demo three different methods of making amazing coffee - the Pour Over, the French Press and Iced Coffee using products from Bodum, Chantal and Zing. Enter to win a French Press! Blue Ribbon Sale - August 8th-13th - Huge Savings! 25% off Coupon! Make plans now to visit Kitchen Collage on the East Village’s First Friday in August. We will feature Maytag Dairy Farms' artisan cheeses. You won’t want to miss sampling some of the Iowa’s best from Maytag Dairy Farms. East Village Wedding Wander - SOLD OUT! Not the one getting married but know someone that is? Refer the newly engaged couple and we will send you a $25 Kitchen Collage gift card if the happy couple registers with us. Reservations are required for the registering couples that will be attending. Register for the Wedding Wander Event below. Sign up is free! It’s a traditional food like no other! Watch these experts, the Lena Sisters, make these tasty potato-based flatbreads -- all with plenty of Scandinavian humor! If you haven’t seen lefse being made, here’s your chance to both see and taste! Come see the new line of beautiful dinnerware and serving pieces, just in time for your holiday table! Stop in to the store during the hours of 10:00 am - 5:30 pm (Thursday) and 10:00 am - 7:00 pm (Friday). Gift with purchase while supplies last! For more information, call the store at (515) 270-8202. Sara Moulton, the trusted host of public television’s Sara’s Weeknight Meals and the author of the popular “KitchenWise” column for the Associated Press, is back with an ambitious new cookbook entitled SARA MOULTON’S HOME COOKING 101: How to Make Everything Taste Better. Join us for hands on demos, specials and expert advice.